The three are the brothers of Ruby, the Hobs born in the litter of 2007. Dimrat, then Archie originally went to live with Carol and her son Aston at their home; she named them Gimlet and Arkamedies originally, though her son gave them the nicknames, Dimrat because he gives the impression of being daft. Bill was offered to me by Fred and I accepted his offer, when I decided that I could house him with Zach, after both ferrets were neutered. 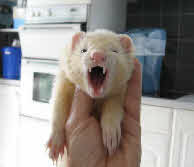 Shortly after the arrival of Bill, I was contacted and asked by Aston if I could find a new home for Carol’s ferrets, because her ill health meant that in the opinion of he and his mother, the ferrets could not receive the attention they felt necessary. I realised I could keep the ferrets as a pair because I had a suitable cage; both Carol and Aston were pleased that I would take care of the ferrets. I felt sad to take Carol’s “boys” away from her as I knew how she doted on them and she was very sad to see them leave. At my home all four neutered ferrets were introduced to each other and hit it off ; there is pandemonium when they are out together, running around and play fighting. I also update Carol on their progress. 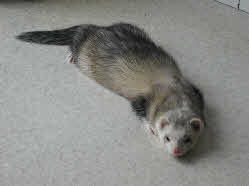 The picture below shows two lap ferrets in the cold winter 2010, the third brother also joined in later. During the winter of 2010-2011 the brothers had a new trick, they all go to sleep when put on my lap. As time passed first Archie died of cancer. Dimrat became ill with enteritis and was a deaths door but a the veterinary surgeon at Trinity vets near Maidstone turned the situation around and prescribed him steroids to control the immune system. He died on 13 August 2014 aged 6 years. Bill died before Dimrat, he developed cancerous growths. Exploratory surgery confirmed it, the recommendation of the veterinary surgeon was followed which was that he be not revived.